I'm often testing out new tools for my online tutoring business but once in a while I come across something that changes the way I teach online. Last year it was Zoom, which has now almost completely replaced my use of Skype because quite simply, it's better. The man who introduced Zoom to me is the co-founder of my next game changing tool that I now use every day to tutor my online students. Together with his business partners Serdar and Kris, James Heywood launched Off2Class in 2015 to solve a big problem in an ever expanding market. What was the problem? A serious lack of high quality digital lesson materials for ESL teachers and tutors. Fast forward 2 years and there are now over 600 interactive, online lessons available at the click of a button within the Off2Class platform. This ever growing library of lessons is like an English teacher's dream come true. The student management system means you can custom design an entire course for individual students by getting them to complete a single placement test. The wealth of lesson materials that can be searched by level, skill, language point or topic make lesson planning a breeze. Put simply, this is a massive time saver for me, which means I can spend more time teaching students and growing my business. Less time planning lessons = more time teaching = more income. 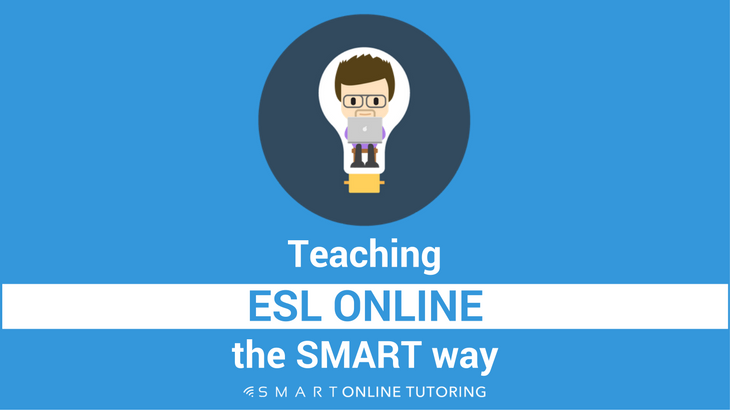 If you teach the popular English exam IELTS, you're probably aware of the lack of decent online materials available. Sure, there's plenty of free sample questions out there, but in the past I've found it difficult to find good quality teaching materials that aren't in a textbook. If you're new to teaching the IELTS exam, Off2Class currently has 43 IELTS lessons ready to teach. All 4 sections of the exam are covered in detail and provide plenty of practice activities but the main focus is on teaching exam skills and techniques, which is very useful for both new and experienced teachers. I've been teaching IELTS for many years now and I'd say these materials are worth the subscription alone. Yes there are free lesson materials out there and you can easily create you own. For most of the 5 years I've been teaching online, Google Slides has been my best friend and I still use it today to create my own tailor-made lessons for free. But this takes time and there are only so many hours in the day. 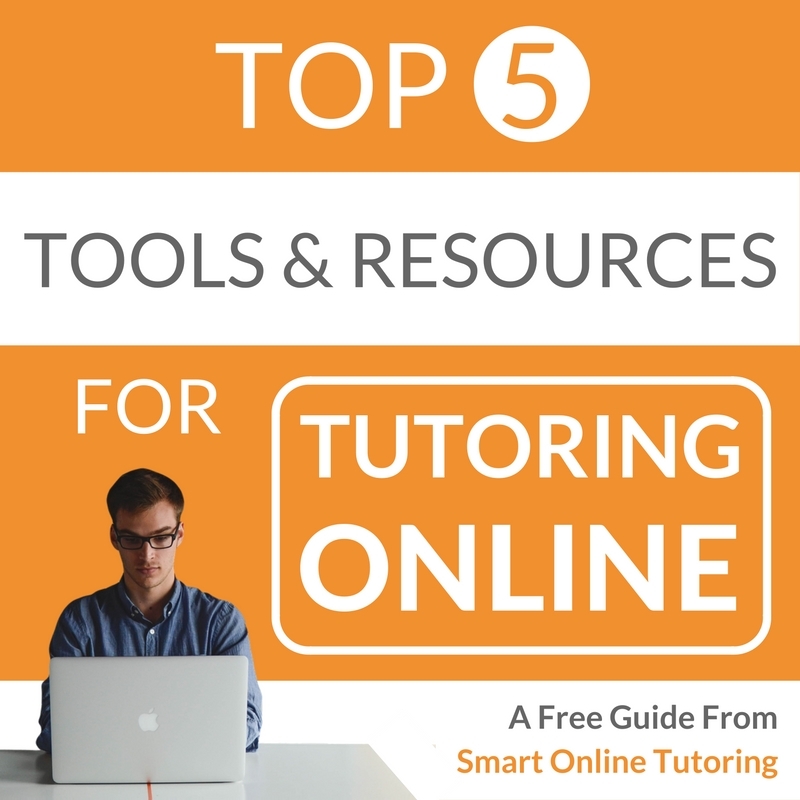 When you're teaching 5 or 6 one-to-one or group lessons every day and running your own online tutoring business like me, having ready prepared lessons is brilliant. Off2Class is a subscription based service but the monthly charges are great value for what you get and start as low as $7 per month for 2 student accounts. Even if you've got 15 students, it'll only set you back $25 per month or $20 per month if you pay annually. You can make that cost back in 1 lesson. When it comes to the technical side of things, using Off2Class is pretty straightforward. Once you've signed up, logged in and chosen which lesson you want to teach, click launch and you're ready to go. Enrol your student so they have access to the slides and then launch whatever video conferencing tool you like so they can see and hear you. 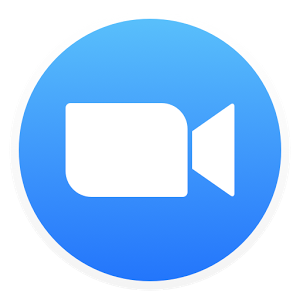 As you know, I use Zoom but it works with other tools like Skype, Google Hangouts or Wiz IQ. At this point I like to share my screen with the student, particularly if they're using a tablet or mobile so that they can see everything I do on my screen. At the end of the lesson, students get a summary of the slides as well as any homework you assign them. Most of the lessons come with homework activities so for those keen students of yours, this is another big timesaver. No more trawling through endless websites trying to find grammar exercises or relevant homework tasks at the right level. When you close the lesson slides, you can send homework to your student in 5 seconds flat! Set a time limit and get an email notification when they've completed it. There's even an answer key that you can use to mark the homework and then send it back to your student if you want. It's so easy. Don't teach online yet? No problem. You can use Off2Class by simply sharing your laptop screen with a face to face student or by projecting it in a classroom using a standard projector or Smartboard. One of the things I like about the team at Off2Class is that they're continually looking for ways to make their platform better. Below every slide in every lesson, there's a button that says 'Give Us Feedback'. If there's something you notice in the slides that needs editing or could be done better, just add a quick note and they'll get back to you, usually by the following day. You can suggest lessons you'd like to see in the future but I'm impressed with the speed at which my feedback has been implemented. The beauty of online lessons and direct access to the author is that I can teach version 1.1 on Monday and version 1.2 on Tuesday. No need to wait a year or two for the next paperback edition to come out! This is a handy tool if you want your student to demonstrate some of their writing during the lesson or if you want to add a quick note or link to something. This avoids having to navigate away from the slides to a separate chat box in Zoom or Skype. This is a significant upgrade because now instead of having to use the pen tool to try and write answers for gap fill activities, I can just click the gap and type the answer. No more looking like a 5 year old with a crayon! 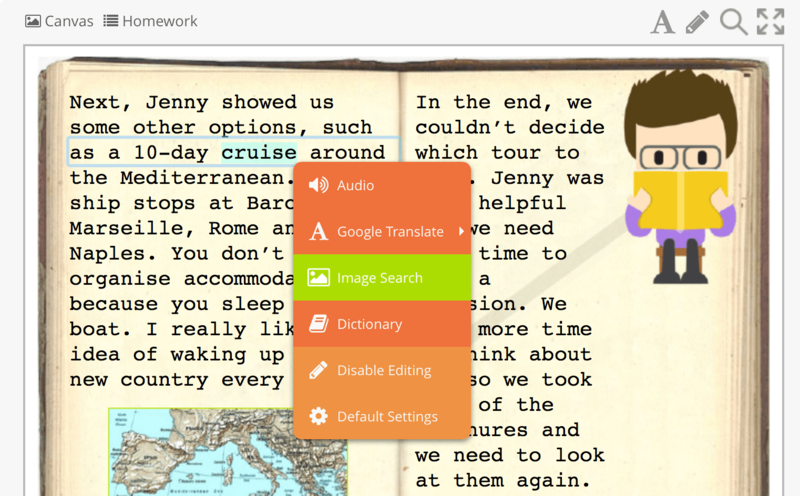 You can also edit any of the text on the slide and unlike the pen tool, text edits will remain on the slides until you finish the lesson and close the classroom. As the saying goes, a picture is worth a thousand words so I love this image search feature for fast vocabulary explanations. In the past, I used to open up another tab, find an image, upload it to my slides and then show it to my student. Now I right click on a word, click the image search option and in 3 seconds I can get that 'ah ha' moment from the student as they understand what I'm trying to teach them. Like the image search, you can right click any word and display a dictionary definition. Good for a quick look up without leaving the slides but I prefer the online Macmillan dictionary as it has more features. Drawing tools are limited and would benefit from an eraser and shape tool to hide/reveal elements of the slides. * The free placement test is a great way to get new students onboard but in its current format, the focus is mainly on grammar and vocabulary knowledge in a multiple choice style reading format. But like with everything these guys offer, they're constantly improving and adding new features and I've been informed that the placement test is about to get a major upgrade. This will include a listening, speaking and writing element, which should give an even better idea of your student's level. Watch this space. As with any good software, Off2Class is a work in progress so it's not perfect. With that said, it currently has plenty of great features and there are some exciting upgrades due for release in the next few months. For newbies, the teacher notes, student management system and ready-to-teach lessons will be very useful. For more experienced teachers, the editing tools allow you to easily adapt the lessons and get the most out of the wide range of materials available. If you're new to online tutoring or not sure about the technical side of things, Off2Class is easy to use. But, if you need more info about how it works, you can check out their comprehensive quick answers section. 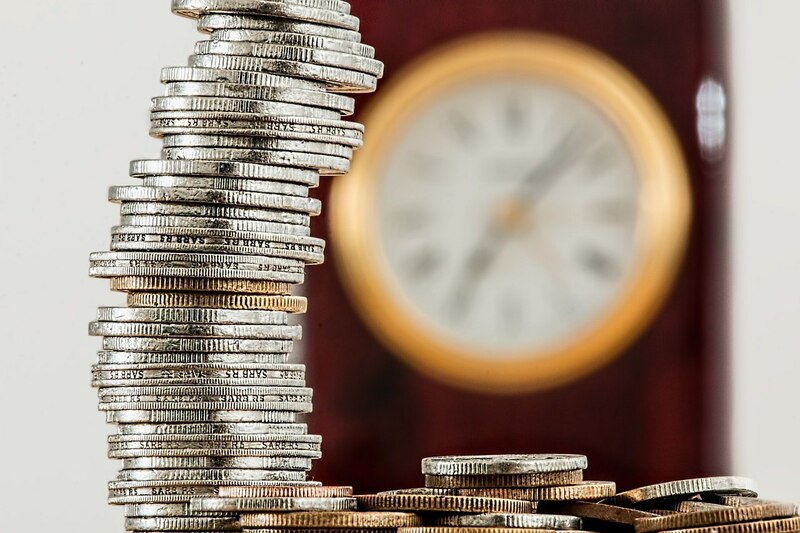 All in all, I'm a big fan of anything that saves me time and helps me earn more money doing what I enjoy – teaching English online. If you feel the same way then head on over to Off2Class and sign up for their free 3﻿﻿0 day tria﻿﻿l (referral link). I'm certainly glad I did.